This series has thus far explored in some detail the various factors – economic, political, ideological, military and cultural – that contributed to the collapse of the USSR and the dismantling of socialism in Europe. 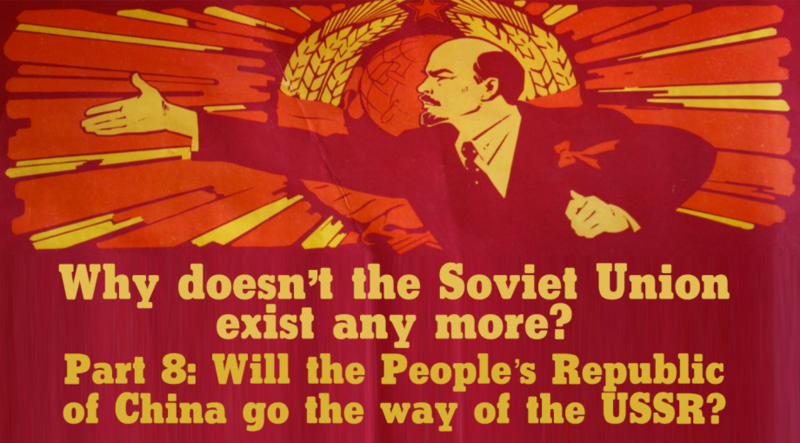 This final article in the series shifts perspective forwards to the present, asking what future socialism has in the world; what lessons can be drawn from the Soviet collapse in order to ensure the continued existence of the remaining socialist countries? These are synthesised into the topic of whether China – the largest and most prominent of the five countries currently ruled by communist parties – is destined to follow the same painful trajectory as the USSR. These are questions of no idle academic interest; they are essential components of the biggest political questions of our era: Has capitalism won? Is there any escape for humanity from brutal exploitation, inequality and underdevelopment? Is there a future in which the world’s billions can truly exercise their free will, their humanity, liberated not only from hunger but from wage slavery? The conclusions I draw are that China is following a fundamentally different path to that of the Soviet Union; that it has made a serious and comprehensive study of the Soviet collapse and rigorously applies what it has learnt; that the People’s Republic of China (PRC) remains a socialist country and an important friend to the socialist and developing world; that, in spite of the rolling back of the first wave of socialist advance, Marxism remains as relevant as ever; and that, consequently, socialism has a bright future in the world. Wait… is China even socialist? The first controversy to address is whether, after four decades of market-oriented economic reforms, China can still reasonably be considered socialist. After all, China today has nearly 500 billionaires and is the top destination for foreign direct investment, attracting over $100 billion each year. There are branches of McDonalds and Starbucks in all major Chinese cities; most people in their daily lives devote more attention to earning a living than to absorbing the teachings of Marx and Engels; and there is startling inequality between the coastal cities and the inland countryside, and between rich and poor more generally. There are stock exchanges in Shanghai and Shenzhen; there is finance capital; there is privately-owned capital. Many leftists – particularly in Europe and North America – look at this situation and say: this has nothing to do with socialism. On the other hand, the People’s Republic of China has some interesting characteristics that make it rather different from the average capitalist country. Most importantly, although inequality has increased over the past 40 years, the standard of living for ordinary workers and peasants has risen along with it. Wealth under capitalism generally has its counterpart in poverty and exploitation (at home and/or abroad), but in China practically everyone enjoys a far better standard of life than they did. Extreme poverty is on the cusp of being completely eliminated – an extraordinary achievement for a country of China’s size. Over the last few years, China has quickly become the global leader in environmental protection, planning to “spend at least $360 billion on clean energy projects and create 13 million new renewable energy jobs by 2020”.15 At the same time as investing heavily in alternative energy sources such as solar, wind, and hydropower, it is divesting from coal, cancelling the construction of 104 new coal plants last year.16 The government has even set up an environmental police force to ensure compliance with green policy.17 China’s forest coverage has increased from around 18 percent in 2007 to 21.7 percent, with targets of 23 percent by 2020 and 26 percent by 2035.18 On clean energy, “the United States is actually playing catch-up to China… China has taken an undisputed leadership”.19 On pollution, “the results suggest that China’s fight against pollution has already laid the foundation for extraordinary gains in life expectancy.”20 These ambitious plans can be devised and carried out precisely because of the location of political power in the Chinese working class. It’s interesting to note that, for example, the combined revenues of two Chinese state-owned enterprises (China Mobile and Sinopec) were greater than those of China’s 500 largest private companies in 2009.29 The state maintains tight control over the most important parts of the economy, often referred to as the ‘commanding heights’: heavy industry, energy, finance, transport, communications, and foreign trade.30 Finance – which has a key influence over the entire economy – is dominated by the ‘big four’ state-owned banks.31 These banks’ primary responsibility is to the Chinese people, not private shareholders. Ironically, market reforms would almost certainly have failed were they not carried out under the tight control of the government and had they not existed within the context of a planned economy. Indeed this is one reason that China’s reforms were so successful and the Soviet/Russian reforms failed. Peter Nolan, who is by no means a cheerleader for centrally-planned economies, writes: “The comparison of the experience of China and Russia’s reforms confirms that, at certain junctures and in certain countries, effective planning is a necessary condition of economic success.”34 Nolan points out that the Chinese state took the lead in conducting large-scale experiments and analysing the results; protecting domestic industry from the sudden appearance of foreign goods; supporting the growth of the state-owned enterprises to a level where they could become competitive in the global marketplace; investing in social and economic infrastructure (transport, healthcare, education, transport, power generation); and coordinating the different parts of the reform programme. Left to the market and an emerging class of entrepreneurs, none of this would have happened. The opportunity to rapidly learn from the advanced capitalist countries’ developments in science and technology was the principal reason for ‘opening up’. Blockaded by the western countries after the revolution, and then cut off from Soviet support as a result of the Sino-Soviet split, China in 1978 was still relatively backward from a technological point of view, in spite of having made some great advances and having developed a standard of living for its people that was far ahead of other countries at a similar level of development. After four decades of opening up, China is now one of the world’s leading innovators in science and technology; it has caught up, through strategically and methodically integrating itself into a globalised value chain, whilst at all times driving a hard bargain, learning relentlessly, and keeping its focus on the needs of its population. USSR got the economy wrong. China is not doing that. At several points in the postwar period, Soviet leaders identified problems in the USSR’s economy and proposed changes; various reforms were attempted, but none of them succeeded in breaking the trend towards stagnation and the widening productivity gap with the major capitalist economies. The Chinese leadership after Mao also identified problems (many of them decidedly similar to those identified by the Soviets) and also implemented reforms; these reforms were resoundingly successful. If “the proof of the pudding is in the eating”, then it must be concluded that the Chinese made much better pudding, since the trajectory of the Chinese economy has been one of rapid growth, ever-improving living standards, and a narrowing of the gap with the advanced capitalist countries. However, vigorous opponents of markets within the context of a dominant central plan have to explain the ‘awkward fact’ that Chinese market socialism has not been a failure, has not led to stagnation, has not led to the fall of socialism, has not weakened the rule of the communist party, and has not weakened Chinese national unity. John Ross points out that, in the 40 years from 1978, China’s economy expanded at an average of 9.5% per year, resulting in a 35-fold increase.51 So while Soviet reform coincided with stagnation, Chinese reform coincided with unprecedented growth. Clearly we cannot simply conclude that market reforms are inherently bad and weaken socialism. Productivity levels were low, and the use of advanced technology was decades behind the US (and, increasingly, the ‘Asian tigers’ – smaller states that were actively supported by the US in the development of hi-tech capitalism as a means of averting any possibility of socialist revolution). Peter Nolan describes some of the problems on the ground: “The system produced little interest among producers in the usefulness of their output. The pervasive atmosphere of shortage meant that there existed a seller’s market for a large proportion of output. Specification of output targets in simple physical terms led to a pervasive tendency towards the narrowing of product range towards those products which were easiest to produce. Thus, the mix of consumer goods notoriously failed to respond to consumer signals and there was a high rate o breakdowns of consumer durables.”55 These problems closely resemble the problems of the Soviet economy in the 1970s as described earlier in the series.56 Indeed, a pattern can perhaps be discerned from the experiences of ‘actually existing socialism’ thus far: while a heavily voluntaristic approach to production can be very effective for a period of time, it suffers from diminishing returns and can’t be sustained forever. Being a poor country with a tremendous responsibility to meet the immediate needs of its huge population, China lacked the resources to invest heavily in research and development, and the resulting low productivity meant that it couldn’t guarantee an adequate standard of living to its people. Cut off from the global marketplace, it wasn’t able to quickly learn from others or benefit from an ever-more globalised division of labour. The post-Mao leadership came to the conclusion that the most important step to solidify socialism and to quickly improve the living standards of the Chinese population was to develop the productive forces by any means necessary; hence reform and opening up. In China, by contrast, “economic growth rates were transformed from the respectable 4–5 per cent of the Mao period to an annual growth rate of 9.5 per cent between 1978 and 1992.”59 Comparing China’s GDP with that of India, Martin Jacques finds that in 1950 – a year after the founding of the PRC and three years after Indian independence – “the per capita income of India was around 40 per cent greater than that of China; by 1978 they were roughly on a par. By 1999, China’s was not far short of twice that of India’s and by 2009 it was over three and a half times as great.” Another decade or so later and China’s per capita GDP is around 4.5 times that of India. In 1978, China’s GDP was around a quarter that of the USSR; by the time the Soviet Union collapsed in 1991, China’s GDP was around half that of the USSR. Today, China’s GDP is nine times greater than Russia’s. China in 1978 was still a poor country, with half the population – almost half a billion people – subsisting below the dollar-a-day poverty line. Today less than two percent of the Chinese population lives below the ‘absolute poverty’ line (currently defined by the World Bank as $1.90 per day). The number of people lifted out of poverty during the reform process numbers in the hundreds of millions. The Chinese leadership has set a goal to fully eradicate extreme poverty by 2020. Ajit Singh notes: “From 1978-2015, real income for the bottom half of earners grew 401 percent, compared to falling by one percent in the US. Chinese wage growth is also soaring, with hourly manufacturing wages rising 12 percent per year since 2001.”65 On top of this, government spending on education and healthcare is expanding rapidly. The Human Development Index (HDI) is a useful metric that has become popular in recent years, compositing life expectancy, educational level and per capita income. In HDI terms, China has gone from 0.407 on the scale in 1980 to 0.727 today (for calibration purposes, Norway is at the top of the charts with 0.949 and the Central African Republic at the bottom with 0.352). China’s increase in HDI makes it the only country that has leap-frogged the ‘medium’ HDI rank, moving from the ‘low HDI’ group in 1990 to the ‘high HDI’ group today (the requirement for the ‘very high HDI’ group is 0.800 – it seems likely China will get there within a few years). Income inequality rose consistently from the start of the reform process – an expected but unfortunate side effect of allowing private enterprise and foreign investment. It rose to startling levels in the 2000s, but numerous studies show that it’s now starting to come back down, as jobs and investment spread inland.70 Deng’s controversial suggestion that “some people in rural areas and cities should be allowed to get rich before others”71 has worked out well in practice. The coastal and riparian cities, particularly Shanghai, Shenzhen and Guangzhou, raced ahead, attracting vast investment and expanding rapidly. Now, however, “companies are moving production to the interior provinces and, in their place, Guangdong is seeking to move up the value ladder, develop its service industries and shift into new areas of production that rely on design and technology rather than the perspiration of its people and the migrant workers from faraway provinces.”72 In the meantime, the vastly increased tax revenue resulting from those that were “allowed to get rich before others” has been spent according to the formula agreed at the start, that is: “for the benefit of the people, a small portion being used to strengthen national defence and the rest to develop the economy, education and science and to raise the people’s living standards and cultural level.”73 In this sense, China is one of the few places in the world where the concept of wealth ‘trickling down’ is not sheer fantasy. The USSR never caught up with the major imperialist powers in terms of technology and productivity, for a number of reasons discussed earlier in this series. From the late 1970s onwards, the technology gap between the Soviet Union and the US grew sharply. In China, however, productivity and innovation levels are catching up with the most advanced capitalist countries. The number of Chinese internet users is around three times the number of US internet users (per capita it is slightly behind the US, but this is still very impressive given that “the relative gap in the number of internet users between China and the US in 1993 was a factor of 3,000”78). Why has Chinese economic reform succeeded when the Soviet reform failed? China’s approach was extremely cautious and pragmatic, “based on a step-by-step, piecemeal and experimental approach. If a reform worked it was extended to new areas; if it failed then it was abandoned.”82 All reforms had to be tested in practice, and all results had to be analysed and learned from. Chen Yun, the lead economist of the Deng era, stated in 1980 that “the steps must be steady, because we shall encounter many complicated problems. So do not rush… We should proceed with experiments, review our experience from time to time, and correct mistakes whenever we discover them, so that minor mistakes will not grow into major ones.”83 This is exactly how things proceeded. Gorbachev’s team were never able to reach consensus for their plans; they merely bulldozed or sidelined those in the Communist Party who didn’t agree with them. As a result, there was never any real unity of purpose around perestroika. In China, the gradual, results-oriented approach allowed the top leadership to win round the Central Committee, the regional leaders and the party rank and file. The fifth article in this series includes a lengthy description of how the Soviet top leadership in the Gorbachev era attacked the Communist Party, questioned its legitimacy, re-wrote its history and sowed disillusion among the Soviet people. The attack on the party was putatively carried out in the name of enhancing democracy, yet the results turned out to be profoundly anti-democratic. The Communist Party had been the major vehicle for promoting the needs and ideas of the working class; once it was sidelined, the workers had no obvious means of organising in defence of their interests. This opened up a space for a pro-capitalist minority to dominate political power and, ultimately, break up the country and dismantle socialism. In a changing economic environment, where private capital was being accumulated and a new class of entrepreneurs emerging, continued Communist Party rule was essential to guarantee that development benefitted the masses and that the new owners of capital didn’t become politically dominant. Moreover, political stability was an absolute requirement for successful economic reform. A few years later, when some people started to call for an end to Communist Party rule and for China to move towards a western-style parliamentary system, Deng reiterated: “Our modernisation drive and the open policy must exclude bourgeois liberalisation… Our goal is to create a stable political environment; in an environment of political unrest, it would be impossible for us to proceed with socialist construction or to accomplish anything. Our major task is to build up the country, and less important things should be subordinated to it… In China, bourgeois liberalisation means taking the capitalist road and leads to disunity.”91 These words were spoken in 1985, a couple of months after Mikhail Gorbachev became General Secretary of the Communist Party of the Soviet Union. If only Gorbachev had been more influenced by China’s approach. Khrushchev and Gorbachev both thought that tarnishing the Soviet Communist Party’s historical record would help to rally forces for constructing a renewed socialism; they were wrong. Xi Jinping on the other hand has been at pains to highlight the continuity between the Mao era and the post-Mao era: “The two phases – at once related to and distinct from each other – are both pragmatic explorations in building socialism conducted by the people under the leadership of the Party. Although the two historical phases are very different in their guiding thoughts, principles, policies, and practical work, they are by no means separated from or opposed to each other.”94 This is no marginal position but a view held more-or-less unanimously by the Central Committee of the CPC. Xi points out elsewhere that “one important reason for the disintegration of the Soviet Union and the collapse of the CPSU is the complete denial of the history of the Soviet Union, and the history of the CPSU, the denial of Lenin and other leading personalities, and historical nihilism confused the people’s thoughts.”95 Although there is much more press freedom in contemporary China than there ever was in the USSR, and while it’s not unusual for individual Chinese analysts to promote “historical nihilism”, such ideas have gained very limited traction, unlike in the Soviet Union where, by the late 1980s, the constant stream of ridiculous Cold War anticommunist propaganda – much of it emanating from state-owned media – had a serious impact on popular confidence. The Chinese government has shown itself to be highly effective at tackling the issues people care about, from poverty alleviation to protecting national unity, from tackling corruption to creating conditions for a constantly improving quality of life. The CPSU in the 1980s was becoming more fragile and less popular; the CPC continues to get stronger, more effective, and more popular. The necessity of maintaining peaceful relations with the imperialist world has been a preoccupation of socialist states from 1917 onwards. All socialist leaderships – those of Lenin, Stalin, Mao, Ho Chi Minh, Kim Il Sung and Fidel Castro included – have pursued ‘peaceful coexistence’ where it was possible (although since it “takes two to tango”, peaceful coexistence has often been largely illusive). The importance of international peace for China’s development was implicitly realised by Mao at the start of the 1970s, when Henry Kissinger’s visit to Beijing opened the way for the PRC finally taking its seat at the United Nations. Continuing US-China communications throughout the 1970s led to the establishment of formal diplomatic relations between China and the US in 1979. Ever since, China has done a remarkable job of ‘playing nice’ with the capitalist world whilst sticking to its own development path and refusing to succumb to the temptations of western-style liberalism. Peaceful coexistence has of course meant some painful compromises, with China essentially relinquishing any claim to leadership of the world revolution. The Soviet Union took on a heavy responsibility as the global centre of progressive forces, giving extensive practical solidarity to socialist states, national liberation movements and progressive governments around the world – including vast economic support to the People’s Republic of China between 1949 and 1959; military and economic support to Cuba, Vietnam, Afghanistan, Angola, Nicaragua, Korea, Ethiopia and elsewhere; training, aid and weapons to the ANC in South Africa, Frelimo in Mozambique, Swapo in South West Africa (now Namibia), PAIGC in Guinea Bissau, and others. In addition to direct aid, the Soviet role as the protector of the progressive world – and its position as one of two ‘superpowers’ – meant that it was forced to devote an extraordinary portion of its resources to military development. The figures vary wildly, but Alexander Pantsov estimates that, “at the start of Gorbachev’s perestroika, in 1985, the Soviets were spending 40 percent of their budget on defence.”99 Indeed Pantsov concludes that “the economy of the USSR collapsed under the burden of military expenditures”. Jacques characterises the Soviet Union as having “opted for autarchy and isolation”, in comparison to post-1978 China, which “sought integration and interdependence”. He further claims that the USSR “embarked on military confrontation and a zero-sum relationship with the United States” whereas ”China pursued rapprochement and cooperation in an effort to create the most favourable conditions for its economic growth.” The characterisation of Soviet policy is unfair. The Soviet leadership didn’t opt for isolation, but it was subjected to isolation by an imperialist world order that was determined to undermine it. It didn’t “embark on military confrontation”, but it dutifully came to the defence of many of its allies that were threatened by the imperialist powers. These allies were not, as they are sometimes caricatured, mere pawns in a superpower rivalry between the US and the USSR; they were popular movements for socialism and/or national independence. Venezuelan revolutionary leader Hugo Chávez made a point of establishing strong relations with China, calling Chinese socialism “an example for Western leaders and governments that claim capitalism is the only alternative.”103 Billions of dollars of oil-backed low-interest Chinese loans have helped to underpin the impressive advances in human development in Venezuela over the last two decades. China has given similar support to Cuba, Bolivia, Nepal, Mozambique, Zimbabwe and South Africa, among others. Gorbachev was also keen to create a more peaceful international environment, to reduce tensions and cut down on military expenditure; however, unlike the Chinese, he couldn’t find a way to do so that didn’t involve outright capitulation to imperialism. With a stagnant economy, rising internal unrest and very few friends at home, he needed both cash and credibility from his new-found partners in the west: Margaret Thatcher, Ronald Reagan, George HW Bush and Helmut Kohl. In order to maintain their friendship, he withdrew Soviet support for many of its allies, gave unilateral commitments on disarmament without getting anything in return, and ultimately gave a free hand to pro-capitalist and nationalist-separatist elements within the USSR. It seems clear that China is not following the trajectory that the USSR did. Its reform process has been successful; the quality of life of its people continues to improve; it is emerging as a global leader in technical innovation and environmental preservation; nationalist separatism is being effectively contained; and the Communist Party of China remains popular and dominant. In short, China has continued to develop forms of socialism that are appropriate to its changing conditions. The lessons from the collapse of the Soviet Union must be thoroughly learned by the remaining (and future) socialist states as well as the global working class as a whole. In the current stage of history, where these states constitute a global minority and where they face a powerful ideological enemy that is determined to destabilise (and ultimately destroy) them, these lessons are broadly applicable. They form a key part of the great legacy that the Soviet experience leaves to the global working class. The way to honour the legacy of the Soviet Union is to study it, to learn from its great successes and its sad demise, and to leverage this history towards a global socialist future. Such is the task left to our generation by the Soviet workers.